A teenager drowned in a river after taking an LSD-style drug, an inquest has heard. Nathan Wood, 16, became "disorientated" after taking the psychoactive drug N-Bomb, stripped naked and jumped into the River Dart near Totnes, Devon. 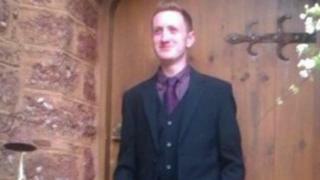 His mother Mandi Retter, 47, said her youngest son was "a loving son, full of life, quite a big character and a joker". Coroner Ian Arrow concluded it was a drug-related death. He said: "If he had not taken that drug that day, he would not have died that day." Nathan had just finished his final year at King Edward VI school in Totnes and was about to start a sports adventure college course when he died in August last year. Ms Retter said she knew her son had been smoking cannabis but was "not aware he was experimenting with any other type of substances". A 16-year-old friend of Nathan's, who cannot be named for legal reasons, said the pair paid £5 for the small white drug which Nathan cut it in half. He then went down to the River Dart to see friends. One of the group, a teenage girl, said Nathan "really did not seem to be himself". "Nathan was tripping out," she said. "I was concerned about him." He stripped naked and the girl heard a loud splash. She said she had no real concerns although she knew he wasn't a strong swimmer. But the group could not find Nathan despite searching the river banks. A police diver found his body on the riverbed the next morning. Ms Retter said Nathan's death caused her "world to fall apart" but said it would not be in vain and warned other youngsters of the consequences of experimenting with drugs.